Aluminum fishing boats and family boats. 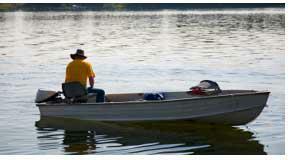 Aluminum boats are most often used for freshwater fishing; however, they do stand up well in saltwater inlets. Aluminum boats are small, lightweight, and durable trailer boats designed for rivers, streams, lakes, and other waterways. Smaller models can easily fit in the bed of a pickup truck or on a mountable rack on the top of the car. Larger models can be transported to the water using a boat trailer. These are lightweight for easy lifting and handling. Aluminum boats are favored among anglers for both fuel efficiency and price. Most aluminum boat models have riveted or welded hulls with two types of bottoms, the V-hull or flat bottom also called the Jon boat. The Jon boat bottom is flat for easy maneuverability in shallow waterways. Aluminum boats are easily stored when not in use and require very little maintenance. Painting an aluminum boat is optional; however, if you do not paint the boat, a layer of aluminum oxide will form on the bottom of the boat. Aluminum boats have bench seating and primarily use small outboard motors accompanied by a trolling motor for slower moving within the anglers fishing radius. The average length of an aluminum boat is 8’ to 24’ and can seat up to eight people comfortably. Aluminum boats are inexpensive with prices starting as low as $300 for the smaller models and upwards of $10,000 plus for the larger models. Bass anglers and those who compete in fishing tournaments love these boats. There are many aluminum boat manufacturers across the US with some of the top manufacturers being, Alumacraft, Duroboat, Lowe, Alumaweld, Ranger, Tracker, and Crestliner. An aluminum boat is the perfect option for any angler because it is lightweight, efficient, and easy to manipulate around the waters. Aluminum boats for sale can be located by using the navigation above to find aluminum boat dealers in your area. Most dealers offering aluminum fishing boats, jon boats and other aluminum watercraft also offer repair services, trailers, storage and accessories as well. 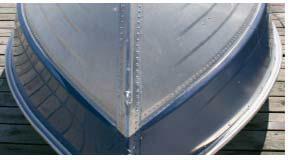 Aluminum boat dealers for aluminum boats. Aluminum bass boats are becoming quite popular these days as these light-weight boats are more fuel efficient allowing more fishing travel for your fuel expenditures. These lighter boats are also easier for one person to handle when connecting to the tow vehicle or stowing the boat. Use the navagation point "Boat Dealers" to find aluminum boats for sale at dealers across the USA offering all types of aluminum boats including fishing, family and customized bass boats.